You can control the settings on this webcam focused on Moscow--moving it left or right and even zooming in and out. 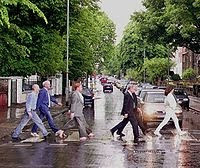 This webcam is focused on the famous crosswalk from The Beatles’ Abbey Road album, which turned 40 on August 8. This webcam is focused on baby panda cubs at the San Diego Zoo!